FROM THE FOUNDER Welcome to our Autumn edition of Lightworker Advocate magazine. Well, the winds of change have once again swept through our wonderful magazine! Iâ&#x20AC;&#x2122;ve recently embarked on applying my Lightworking talents to the recruitment industry and have a bit less energy to spend on the magazine. However, this was a fabulous opportunity to invite new energy into our magazine. We now have a content co-ordinator and Carolyn King has joined us to help the magazine continue to thrive. When I read this edition, I can honestly say that my soul sang. With every word and story, I felt myself lift and then lift some more. I am so proud to have the help that I have to continue this magazine to be a great lifter of your Spirits. As I write this it is the day of the Autumn Equinox and a super full moon! Amazing how the cycles can play a big part in our lives. Just like the cycles of this magazine! Every edition I have worked on has helped me heal an aspect of my own life and more often then not I am in need of each article that comes my way. The principles have an energy of their own and the Lightworker Advocate feels to me like its own being, helping to bring light to the collective consciousness and the cycle we are currently in, regardless of month, season or timezone. Each magazine also brings it's own vibe, it's own theme and some amazing new content each time. I always feel humbled by what I read as I carefully add each article to the Lightworker Advocate. Each one gives me a different feel, love, experience and a a somewhat connection to the writer and what may have been feeling as they wrote their piece. I applaud them all for sharing their honesty, their integrity and their wisdom with myself and all who read them. Thank you! I wonder what the next cycle will bring! Until then, enjoy this Autumn April Edition! You will not be disappointed! Carolyn King is on a mission to help people live a fulfilled life with real and lasting happiness and is especially passionate about helping those that have hit their rock bottom as she has personally overcome the lows and disconnectedness of depression and the anxieties and stresses associated with corporate burn out. She has studied many different healing modalities and continues to develop her skills, integrating them into her life, creating programs for her client with the intention of empowering more people. LIGHTWORKER PRINCIPLES #1 HONESTY Without it, we live a lie. With it, we can begin to live the truth of why we are here. #2 OPEN MINDEDNESS Without it, we live in fierce judgement and narrow-mindedness. With it we are open and accepting of all the resources we need to contribute towards our enlightenment and the growing consciousness of a better world. Wthout it, we are resistant. With a bit of a sprinkle of willingness we can move mountains. We invite Spirit into the very nature and fabric around our every decision. Without it, we stay stuck in toxic recycled garbage, our hearts clamouring to be let out of their prison. With it, we are free to move on, let go of the past and to love with an open heart. Without it we feel alone, separate, abandoned & narcissistic. With it we allow ourselves to connect with the infiniteness inside everyone & together we can co-create with harmony. Competition dissolves. Cross pollination emerges. Without it we are easily distracted and led astray. With it we are able to listen to our guidance and follow the next step we are guided to do - even if that is all we know to be true. Without it we don't trust and we are cynical. With it, we are able to take big leaps knowing that we are always safe 100% of the time in the truest sense of the word. Spirit always has our back, even when we feel we have been let down, with faith we are able to see all experiences are in our highest good. Without it, we blame and obsess about what others have done to us or others. With it we can stop playing the victim card, pick ourselves up and start to create the life we really want to live, free from oppression and start to role model the change we want to see. Without it, we fear and we hate. With it, we are able to see the cry for love in any given situation and it melts our cold hearts. We are able to love ourselves enough to stand up for what we know we deserve. Without it we feel broken. With it we feel that anything we perceive is a lack, really holds an unforeseen gift. We are able to practise self-love, self-protection, self-care, self-awareness and self-moderation. Without it it we feel depressed and take life too seriously. With it we find meaning in our life purpose and have a lightfilled view of every situation. Without it we feel unrest, anxiety, we fear boredom and we thrive on drama. With it we know that every decision that comes from a place of peace creates more peace. We become a profound transformational presence of peace. 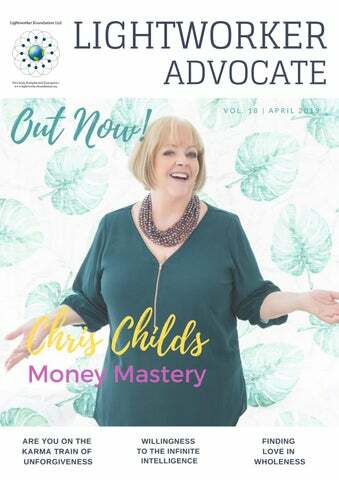 GETTING HONEST WITH MONEY MASTERY COVER STORY CHRIS CHILDS / PRINCIPLE HONESTY / WORDS BY MICHELLE LIGHTWORKER You don’t know what you don’t know. You can’t change what you can’t see. So let’s get honest about our finances! The state of our finances are a reality, whether we want to face them or not. You may read this and think the worst. However, what if it was the other way round? What if you could accomplish more than you could ever imagine RIGHT NOW with your finances to set you up for life? Impossible? Just ask Chris Childs. This money maker magician has the ability to see way beyond what your current consciousness may see. There are so many legitimate choices that you have right now that you may not even be aware of that will not only save your financial skin, but will excite you. I met Chris late last August, just before embarking on a 5 week European vacation. I had no idea what the potentiality was of my financial situation until I met her and listened. The only thing going for me that I can remotely say was on the positive side with regards to money was my ‘No fear’ approach to life. As many of you know, I live by faith (one of the 12 principles) not fear. I do the actions of turning up to life and then I let go of the rest. Well, this attitude was aligned to what Chris calls her ‘Money Mindset Mastery’. So, little did I know that I had attracted a money magician into my life because I was well and truly ready. 6 months and 3 property purchases later, I realised just how much the lack of knowledge I had prior had been my only stumbling block to financial freedom on the long term. That was it! I had all the spiritual tools to move forward and make fearless decisions that I knew with évery cell of my body’ were right. I had developed my intuition. I had developed a money mastery mindset, just hadn’t had the actual step by step knowledge to implement it. The day after I met Chris, I was dreaming about being helped by her and her husband Jack who operates the property arm of Think Money. I awoke with an incredible surge of activation in my Third Eye. I saw geometrical shapes hurtling at me. Having never experienced this intense visual before, I questioned what it was about rather than just passively accept it. The answer? I was reactivating things that I had done hundreds of times before in previous lives. The message? Everyone needs a home. From the beginning of time, this is the truth. You’ve helped people over and over again to have a home. This is an activation of what you already know. The action? Step up and say yes. Trust I had attracted the right advice at the right time. There are parts of Chris’ story that I resonated so greatly with. For one, she retired in 2000 and after 6 weeks, she swiftly decided that retirement was not for her. I often think to myself, when reflecting on retirement, ”Retire from what exactly?” For us philanthropic types, we can’t just retire from wanting to help the human race. And that is what Chris thrives on. I love that about her and want to sing her praises and celebrate her pure 26humanitarian heart. CHANGE YOUR MIND ABOUT WHAT IS POSSIBLE WORDS BY AMANDA CAMPBELL PRINCIPLE - OPEN MINDEDNESS Paralysed at age 29, I was faced with a permanent disability and my worst fears were in fact realised. I was not looking after myself emotionally and the stress of deeply believing that I was not ok, caught up with me. My body started to mirror how emotionally paralysed I felt and it literally went so numb that my body stopped working and I lost complete mobility on the left hand side of my body. I could not wash, walk or feed myself and I could not get dressed without help. I was forced to completely stop and reset. The doctors said that they could not guarantee I would ever recover, it was now simply a waiting game to see if I would respond to treatment. That was the hardest darkest time of my life. But the best thing that could have happened. It’s like lighting a candle in a well-lit room; you don’t really notice the light. It’s when everything becomes dark, that’s a time when you find your light and what you are truly capable of. When I was young, I was a happy, motivated girl. But the trouble was, the confidence I expressed externally didn’t always match what I actually believed about myself. Manifesting as feelings of anxiety and confusion, I did not understand that this feeling was a symptom reflecting beliefs such as I was not good enough or capable. What you deeply believe is a mirror of your health and how you perceive your environment. It’s more common than you realise, we can truly want to feel loved, successful or enough but the brain, perhaps from prior trauma and past experiences actually believes that this is not possible, or you may feel you do not deserve it. I truly believe that this lack of alignment of my ‘conscious desires’ that were conflicting with my ‘deepest ingrained beliefs’ and therefore programs (subconsciously) led to inflammation and stress in my body. It can make you feel empty, vacant and sad. When I found myself functioning from this very alarmed state, I inevitably focused on what I didn’t want and what I was scared of that could happen - exacerbating the problem. Essentially creating a sabotage cycle - sound familiar? We love this interview with Dr Joe Dispenza talking about how he healed himself - watch it here! There was a pivotal moment where everything changed for me. About 5 or 6 weeks in living in rehabilitation at hospital, my toe finally moved for the first time. It was in that moment I found hope. From that moment on, I started to channel my energy differently. I focused on what I wanted instead of what I didn’t want. The impact that made on my recovery was beyond my wildest dreams. There was an obvious physical difference for me, when my mindset shifted so did my body and my mobility started to change. I went from being in a wheelchair, to learning how to use a foot brace, to having just my knee taped up…. to walking on my own. Those first few steps walking again were indescribable. I will never forget them. I walked and ran the oval within 6 weeks. Achieving this recovery when I really wasn’t ‘supposed to’ created a shift within me what was enormous. It was the evidence I needed to feel hope again, as I was told I may never recover and that my disability may be permanent. It allowed me to change my mind about what was possible: For my health and mobility The course of my disease and therefore my future And later into other areas of my life (love and career) I took a balanced approach in my health program and thank the doctor’s, physio’s and kinesiologists, a whole integrated team that helped me. I had people stand with me when I couldn’t stand. After my recovery I was inspired to be there for others going through similar extremely difficult times in their lives. I have now dedicated my life paying it forward to help others to optimise their health through times of setbacks. In recent days there have been quite a lot of information, ideas, tools and awareness that exists to manifest abundance or what's known as the Law of Attraction. There are numerous laws of nature like, Law of Action, Substitution, Rhythm, Vibration, Polarity and so on. Irrespective of caste, creed, continent, colour, gender or occupation, each and every human being has the divine right to live a life of abundance. When there is a law it needs to be addressed, and if, as human beings, we have an establishment and rules to follow in this lower dense three dimensional world, we could imagine how significant it is to abide by the Divine Law in order to achieve things. Interestingly there are many successful people in history acting as a living proof, even today in our lifetime, manifesting abundance. As per the divine design, every one of them have achieved the state of bliss and fulfilled their divine contract. If we look into the life and teachings of ascended masters and greatest people, we could possibly find out their willingness to be divinely driven by the infinite intelligence of the super conscious mind. We are aware about the power of the subconscious mind, reprogramming the unwanted beliefs and thought patterns that do not serve for our highest good, affirmations, power of words, visualisation and realisation etc. Of course willing to learn is a very good start but willingness is not just a word or something temporary. It is a consistency, determination, an ongoing process with every single moment beyond time and space living in perfect harmony with the highest self. So that we need not say," Why couldn't I attract this thing" or " It's not working for me'' or "I have everything in my life but still find no peace and complete satisfaction". Therefore let's ask ourselves first: Does my willingness to attain or achieve certain things come from the heart space/intuition In the process of manifestation am I willing to be truly aligned with the highest good of all Am I willing to be 100% faithful with the divine plan even before it manifests in reality Even if God has an alternative plan or unexpected events in my life am I willing to surrender to the divine guidance at anytime? Once we are ready to take action to lose the attributes of egoistic mind like resentment, fear, anger, grief, doubt, time, space etc and be willing to tap in to the love based beliefs, intuition, faith in ideas of the superconscious mind and thereby impress the subconscious to re-programme. Then we are no longer the warriors of manifestation but become the masters of ascension by raising our vibration! 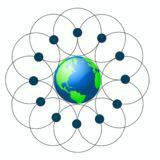 FiveD.TV is a worldwide subscription video on demand (SVOD) streaming service that provides curated conscious media in three primary channels— Star Nations, Human Ascension, Earth Revival—to its global subscribers. Many of its growing titles are available for streaming exclusively on FiveD.TV through most devices connected to the Internet and some of the programs are generated by content produced or owned by FiveD.TV. FiveD.TV has for its symbol the “merkabah” also spelled “merkaba” and that represents the divine light vehicle allegedly used by Ascended Masters to connect with and reach those in tune with the higher realms. “Mer” means Light. “Ka” means Spirit. “Ba” means Body. Welcome home to the Fifth Dimension. Forgiveness can be difficult and sometimes we convince ourselves we have forgiven someone, but still wait for Karma to balance out the scales. In this space we are sitting in a space of unforgiveness. Not forgiving someone, holding on to the hurt, on any level, is like continually ingesting poison. When we hold onto things from the past, it sits in our mind, in our body, in our life and quite often doesn’t affect the person we haven’t forgiven. Forgiveness can sometimes be difficult, especially when we feel hurt on a deep level. And when we believe that forgiving someone is a sign of accepting their behaviour, that on some level we condone what they have done, it can make forgiveness even more difficult. We can also be holding to fear, afraid that if we forgive the other person we may be hurt again. But forgiveness is not about the other person. First and foremost, forgiveness allows us to return to peace. When we are holding on to unforgiveness there is an uneasiness within us that we carry. Forgiveness is important for your own peace of mind, for your own feelings of peace within your body and for your own sense of peace in your life. Remember that forgiveness does not mean you must forget what happened, nor does it mean that you need to let them back into your life. Forgiveness is a personal journey to return to peace within you that you deserve. Here is a process I guide my clients through when they need assistance forgiving. 1. Write down what the hurt was. Exactly as it happened. 2. Look at the situation and honestly evaluate what part you played in the situation. 3. Try to understand why the other person reacted that way. Does this offer you some insight into the situation? Did what they say have some truth in it? Did it hit a nerve within you? If so, is there something within you that needs to be released or healed? 4. Remember what others say to us is not absolute truth. We have a choice to reject or take on what they say. 5. Ask yourself why you can’t forgive them? Are you worried about being hurt again? Is there a way to forgive them but also protect yourself from further hurts? 6. Look at what your life would be like if you NEVER forgave them? Would you regret it later down the track? 7. Look at what your life would be like if you DID forgive them. Would you regret that later down the track? 8. Choose if you can for forgive them and find peace and closure in the situation. HOW TO FEEL LESS ALONE AS A LIGHTWORKER WORDS BY TAHLEE ROUILLON PRINCIPLE - UNITY Growing up as a Highly Sensitive Empath was hard. As a child I was called melodramatic. As a teenager, I was told I needed to stop “flying off the handle”. My emotions were a rollercoaster, even as an adult. Similarly, the highs were just as potent. Music gave me goosebumps and often moved me to tears. I would get lost in long books and wild poetry. I felt feelings I couldn’t even name when a crisp autumn breeze caressed my face. Needless to say, I often felt very alone. Which was so frustrating because all I wanted was to be accepted, understood, and feel like I belonged. I craved union. Perhaps you can relate? Sensitive souls like empaths and lightworkers are often some of the most misunderstood people on the planet. We notice things and we ‘know’ things and it confuses and baffles people. Our experiences are dismissed and diluted. People often say ‘it can’t be that bad’, but it is. It really is! Tahlee Rouillon is a music composer & founder of Sonesence. She creates sonic sanctuaries for empaths & sensitive souls through her soothing meditones music. When heard with headphones, meditones create calm brain waves effortlessly; perfect for sensitive souls struggling in an overwhelming world. Tahlee also loves forests, friends, good food, Instagram, & laughing out loud. Real loud. When you hear it, you’ll know. Discipline is about the decisions you make every day in every way because they relate directly to what you want and who you are in your essence. There are also places where you make decisions that are not putting you first. My guides tell me that when we put others before ourselves, we are stepping out of flow and integrity and making decision based on someone else’s needs and so are not being honest with ourselves. We are outside the discipline of the self and the guidance informing us of what is for our highest good. Consider for a moment your morning routine, you may indicate that you are very disciplined and follow your rituals and routine to the letter every day. Is this repetitive? Are you surrendering to guidance and discipline of the self? Do you ask for guidance about what your human body wants to eat today, what it would like to wear, what time it would like to leave, what music it would like to listen to or are you doggedly sticking to a pattern of behaviour? The guides share - to truly be in discipline with the self is to be in harmony with the Soul and your purpose in every moment. I hear them saying the “SOUL PURPOSE” for our human existence is to be with ourselves as a human entity and experience this with JOY and LOVE. What you do each day and to what degree is part of our free will and our ability to manifest our earthly experiences. I am aware there is a lot of language around manifesting, having the best life ever, you can be who you want to be and yet this is also about surrendering the Ego and being disciplined and connected to the guidance offered within our own ‘live stream’ with the Divine/Universe/God/Channel of Love/ Buddha. As an Empath, I feel the difference of being guided and me being stubborn. One is where the world expands and my interactions, conversations and experiences are aligned, amazing, strong, heart driven and honest. I do not have an investment in the outcome – simply the experience. Sometimes this energy leads to new guidance and experiences that I understand are for my highest good. The secret to success is mindset. Simple, right? But it really is just a simple shift in your thinking. Nothing shifted in my outer world until there was a shift in my inner world. THEN the universe manifested my reality. So I’ve learned that happiness really IS an inside job! A few years ago I was little Miss Comfort Zone! My multiple fears paralysed me from moving forward in my life, plus it was easier and felt safer to play small and be the victim of circumstances, rather than take any responsibility for my life. For nearly ten years I stayed in a soul-destroying job, my health was the worst it had ever been and I had a serious car accident, but I went straight back to work – because it was ‘safe’. My personal self-development journey really began when Oprah came to Australia in December 2015. Oprah quoted William Ernest Henley who said; “I am the Master of my fate. I am the Captain of my soul.” Hearing Oprah speak those words struck me like a bolt of lightning - I realised I needed to have a conversation with myself around accountability. I had been playing the victim my whole life, blaming others and circumstances for why I wasn’t happy with my life. I finally realised no-one can change my life circumstances but me. What were my deepest emotions and feelings around change? Was I really willing to step up and change my life? Was I ready to own my own mistakes? I really questioned what were my core beliefs about myself and who was I really? I AM JUST ME! There is power in that statement because I realised I am perfect just the way I am. It was time for me to just own it! In order to create my ideal life I first had to learn what that actually means to me as an individual which took a lot of internal work. I joined a meditation group, read self development books, watched webinars and enrolled in courses. We are all chasing it. We are all wanting it. Love. To be loved. Being love. Finding love. Falling in love. Eat love... Eat love? That’s right! Now you can literally eat love. Through chocolate. Oh my gosh! I KNOW! How awesome and exciting is this? Eat love through chocolate! How guilty do you feel when you eat chocolate? Do you regret it afterwards or do you indulge in it guilt-free, knowing this is good for you? Some chocolate actually IS good for you. Some of the ingredients I use in my chocolate are GOOD for you! Cacao enhances the mood. Maple syrup has plenty of health benefits especially when it comes to your liver. There are so many benefits to your organs. Cacao butter and coconut oil are the same. And we all know that Himalayan Salt is vital for us, but I am not here to list all the health benefits of the ingredients. Some chocolate left me breaking out with eczema. I felt it in my body straight away if I ate too much. I knew I needed to create my own. Of course fasting helps strengthen the body. Yet, I believe if you eat food that you know and feel serves your body, mind and soul why would you eat something else? All the time! Anyway, this is about creating healthy options. I love food. I am passionate about food and more than anything chocolate is my favourite. Most days anyway. When I was younger I used to steal my sister’s chocolate sandwich and switch it for the salami one. Maybe I used to be more addicted than passionate. I can remember sitting on the toilet calling my dad telling him that I needed to poop but I couldn’t. He said straight away: “Stop eating so much chocolate!” I asked: “How do you know I ate too much chocolate?” He would say: “You are my daughter.” Well, lots of lovely memories around chocolate. In fact, I believe that I have my weakness for chocolate from my dad. Or is it as my friend said: “Don’t trust anyone who doesn’t like chocolate.” Is there truly such a thing? Do I really want to know? Anyway, I invented together with the beautiful Amy J. Young, Lightfilled Food - an outlet to create new lightfilled recipes so we don'’t have to evolve into living off carbon monoxide or chemicals. An option to indulge into chocolates knowing it serves your body is a wellness treat for the heart and the soul. Who doesn’t love that? Please watch the video for the how to’s and how the love gets into the chocolate. I hope you love it and my love for what I do vibrates to you. If you would like to order your favourite flavour or order chocolates I make for you, please message me on Facebook on Lightfilled Food or via Magenta Goddess. Taste tests available. I love how there is a self-love topic on the forefront of many magazines, social media posts and online articles. I love that it is finally becoming the topic of a number of conversations between so many. However I have to be honest, I have never quite understood what self-love means. Sure I have had thoughts about what it is and can only assume what I think it is, but as I sit down to write this I find myself scratching my head as to what it really means to love myself? So I will start here. There are days when I look in the mirror and I think, hmmm, ok, I look nice today and there are days when I cannot stand to even look at myself. So is this self-love? Being ok with what is reflecting back in the mirror? Maybe, but surely it's more than that? What if we go deeper? What is behind the clothes, the hair, the make up? A human body. Do I love this body? Hmm it's ok i guess, but If I loved it more would this be self-love? Maybe. What is behind the body? Organs, muscles, tissues, blood. Do I love this part of my body? Sure. I'm thankful, it works in a way I don't quite understand and the design of how it all works together is nothing short of mind blowing. If I love this more is it self-love? It could be. And behind this? Emotions, feelings, senses, thoughts. An incredible vast network of these unseen "things" that run deeply through my body. Carrying every single thought, action and memory and delivering it with lightening speed along carefully grown networks of energy within my body. Can I love this? Would this be self-love? Can I go deeper? What ever could be beyond this beautiful design? Atoms, neutrons and a vibrating energy that may not be seen by the naked eye or even a microscope. I can't see it but can I feel it. Yes. If I love this would this be self-love? It feels good, surely. Hmmm, maybe? Could I try to go deeper then this? What is it? I can feel it, it's like an infinite open expansiveness that feels a bit like space. But it's peaceful and it feels like, well it feels like, peace. I think it feels like love. I don't know how to explain as I cannot see it with my eyes but I can feel it. I can feel it with everything that I am. It feels like love but more then just that. Can all this be within the person that I am? All of this? If I can love all of this, every particle, every network, every blood cell, every organ, every skin cell and every single part of my expansive connected energy. Is this self-love? Loving every single part of myself? From every thought, to every action to every moment, movement and sense. If I can truly understand that my self as a whole is made of love, I can love and be loved. When I drop back to the surface, my body, my clothes my hair, how can I not be in awe and in love with all of this? A whole universe inside of myself that I never knew existed but shows up as this being reflected back to me in the mirror. Wow. Why wouldn't I want to take care of this amazing temple that houses this incredible expansiveness! This amazing well of infinite energy that feels incredible. How can I not stand here and be moved by this? So I want to leave you dear reader with this. It has been famously said.....'And in the end, the love you get is equal to the love you give,'...think about that for a moment. Not my quote but a famous one from a very well known song. I may not have understood it until now. But now I think I understand self-love and how wholeness relates to this and what it means to me. So from my heart space to yours...you will be loved. Completely! In Wholeness. BOOK REVIEW / BOOK REVIEW / BOOK REVIEW THE THREE ROOMS: WHICH ROOM ARE YOU IN Book Author Kevin Murphy "Remember, happiness doesn't depend on who you are or what you have, it depends solely on what you think." Although the Buddha is often credited with that quote, its origin doesn't really matter. Few people would dispute its message. So if most people would agree that our thoughts determine how we feel, then why are we not very good at monitoring our thoughts? The analogy of The Three Rooms can help. From The Three Rooms perspective, our thoughts can only be in one of three places: they can be in the past (the Past Room); the future, (the Future Room); or the present (the Present Room); and whichever room our thoughts are in determines our experience of life in that moment. Since our thoughts can move back-and-forth in the linear concept of time, it is imperative that we observe our thoughts. It is that act of observation that separates our awareness from our thoughts so we are no longer at the effect of them. This awareness, or consciousness, is what all the spiritual masters have urged us to connect with. In order to access this Divine Consciousness, we need to know where our thoughts are. That's why the fundamental question that we need to ask ourselves is "Where am I?" In other words, "Where are my thoughts?" If you can ask and answer that simple question, then you have already separated your awareness from your thoughts. Unlike the physical body, our thoughts can be in one of three places, and each place leads to a different experience of life. The Past Room: When our thoughts are in the Past Room, we continuously think of events that have caused us to feel negative emotions based on what we perceive others to have said or done to us...or us to them. We tend to dwell on those thoughts which further perpetuates the negative emotions they generate. Resentment, guilt, anger and shame are a few of the emotions we feel when our thoughts are in the Past Room. The Future Room: This is when we think about all the things that can go wrong and we focus on the worst-case scenarios. We look around at what is, and we project the image of what we don't have into the future. The feeling of stress and anxiety that this creates is what actually pushes away the very things we desire. When our thoughts are stuck in the Past or Future Room, we are constantly seeing the world as separate from us, so we feel the separation from our own Higher Self. That is the singular cause of the negative emotions we feel in the Past and Future Rooms. The Present Room: Instead of looking at what is, this is when we focus on what can be. There is an absence of negative thought, so there is nothing preventing us from feeling our connection to our Source. The love that we feel when we are in communion with our Higher Self is the feeling that allows us to attract into our lives that which we desire. If we are going to observe which room our thoughts are in, we need to better understand the thoughts that we are observing: A thought is a vibration that is stored as energy in a Field of Potential Probabilities, waiting to manifest. This field of energy has had many names. Sometimes it is called Divine consciousness, prana, or the Akashic field. Other times it is called the quantum vacuum, ether, or the zero-point field. No matter what name you apply to it, it is the Source energy that makes up all there is. to step into your light, but you are also creating more tangible conscious media at the same time. How good does that feel? Peace THESE PRINCIPLES ARE THE CENTRAL THEME OF THE MAGAZINE AND ARE DESIGNED TO RAISE THE VIBRATION OF THE READER AND CONTRIBUTORS ALIKE. Media kit in submission of articles. Welcome to the April 2019 Autumn Edition of the Lightworker Advocate!